When I was in Liberty's in London in February I bought one of those pin cushions that go around your wrist. It's one of those gadgets that I didn't know I needed, and then wondered how I ever did without it. That was until Tuesday night when it broke! 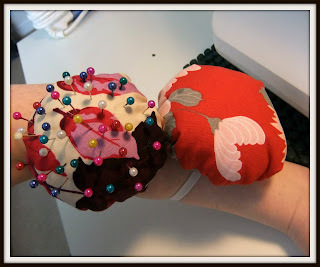 I had stumbled across a tutorial to make a wrist pin cushion (sadly I can't remember where), and had saved it on my computer. Here's the link. Anyway, I made two, because, you know, one could go missing or something!! Both are made from scraps from two skirts I made. The tutorial is really good, loads of photos and easy to follow. The only thing I'm not happy with is the elastic because it's a bit narrow, but earlier on I found some thicker black elastic I had completely forgotten about, so I'll change the white elastic for it. And here's the offending broken pin cushion. Humph!!! I have also started a new hat (because I don't have enough, ahem). This one is Aeonium by Woolly Wormhead. 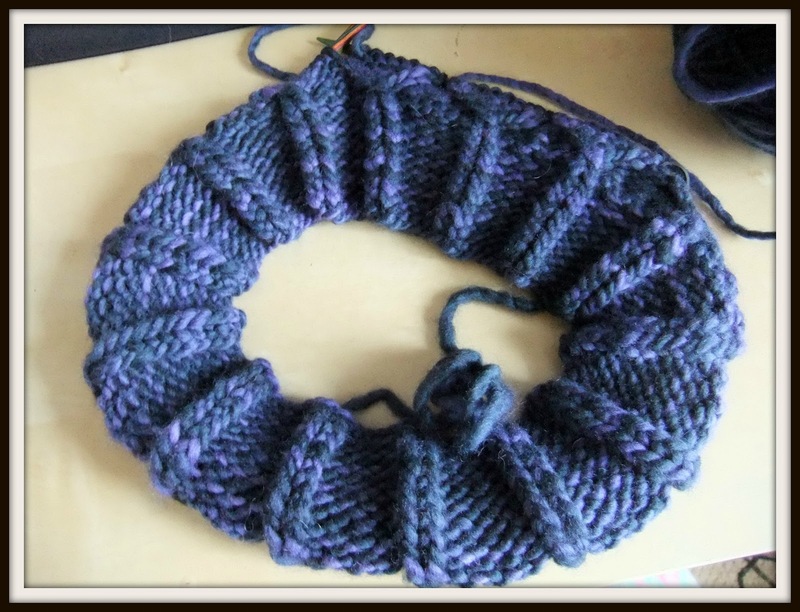 It's been in my Ravelry queue for a while now, and I really love those cables. I'm using some Malabrigo Merino Worsted which I got from This Is Knit, the colour is called 052 Paris Nights. 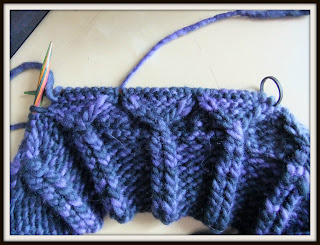 The above three pattern repeats between the needle tips and the black stitch marker are the last row in the five row pattern repeat; and below is the whole thing so far which is mostly the band. This has been inspired by a show I watch on Channel 5 on Sunday nights called "Once Upon A Time". Two of the characters wear some lovely woolly hats. Naturally there is a Ravelry group! And finally, here are my next four Smoothie Hats. According to The Big Knit Ravelry Group it's back on for this year - yey!! I love Woolly Wormhead's hats. I have a skein of Malabrigo Worsted that is calling out to be knit! I must make some little hats now that I'm on holiday. Great pincushions too! Thank you! 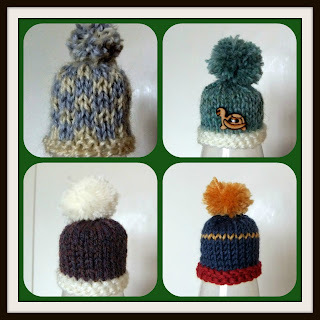 I a big fan of Woolly Wormhead's too, in fact I've just queued another hat pattern. Thank you! I prefer my pin cushions too. 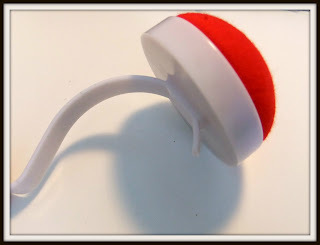 They're bigger than the broken one, so more pins can fit on them; and the broken one had an annoying bit at the bottom of the wrist band that got in the way.